1:5:10:029 Tip: Compact fluorescent lights (CFLs) contain an average of 5 milligrams of mercury (older ones may have up to 20 milligrams). They should be recycled to remove and reclaim the mercury to prevent it from contaminating landfills with the hazardous waste. Tomorrow I will talk about what to do if a fluorescent tube breaks. Every county in the United States is supposed to have a hazardous waste disposal program, but most don’t accept fluorescent bulbs and tubes. IKEA stores have added mercury recycle/disposal station in its customer service area where they accept used CFLs and batteries at no charge. 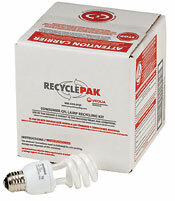 Sylvainia corporation has set up a disposal program using the RecyclePac shown above. The pack contains padding material in a shipping box which is sent by to the recyclers. The cost of disposal works out to a little over a dollar a bulb. Check with www.earth911.org to find other disposal options by entering your zip-code (or call 1-877-EARTH911). You can obtain a copy of their annual report and additional information at www.lamprecycle.org. Finally you should check directly with your local waste management agency for recycling options if they don’t have an easy recycling/disposal process in place in your community, you may choose to lobby them and your local community government to set something up.